You are currently browsing the category archive for the ‘Best Supporting Actor’ category. Look, I think it is great that Robert De Niro wasn’t a parody of himself for the second time in two decades (I’m a strong believer in his performance in Stardust). I hope this is a sign he’s getting his groove back. But do we need to give the guy a nomination and maybe even an award for it? He’s got plenty. I understand mental illness is catnip for Oscar, but come on. He’s out-acted by every one of his co-stars in every scene he is in. De Niro’s nomination is one of those things that makes you wonder if the Academy really is qualified to be doing this. I think it is great that the Academy sometimes finds space for the small roles in this category, and Alan Arkin turns in a fine performance. I personally don’t get the nomination, though, and read it more as a combination of the need to nominate someone from the cast and the irresistible temptation of the Hollywood producer character. Arkin approaches the character with zeal and zest, but I think the role is just too limited. Tommy Lee Jones pretty much makes everything better. If I had to nitpick here, maybe I’d come up with something about how the character may be too broad, but really the only complaint I could have is that the character occasionally gets lost in the sea of characters the script needs to service. He’s on the bubble for my personal list. The Master is a horrendous movie, so maybe I’m overcompensating here. 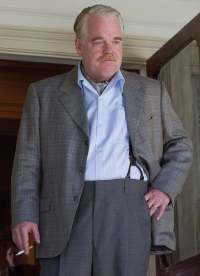 But it is kind of astounding how smoothly Philip Seymour Hoffman slips into this mesmerizing persona. The role isn’t always showy, but instead provides a stark spotlight to highlight everything else in the film. I don’t think Amy Adams gets a nomination here without being able to play off of Hoffman. The thing is, while I don’t think the argument is as clear cut as the next guy, because I had to spend some time thinking about it, but I have Hoffman as a lead actor in this role. I’m willing to entertain discussion otherwise, but compare his role to that of Alan Arkin or Tommy Lee Jones. Your choice pleases me. You will not be killed. My toughest decision in this group was whether to put Christoph Waltz first or last. He wouldn’t have been on my Supporting Actor ballot. Because he’s not a supporting actor. He’s quite clearly a lead actor, and I’d probably argue the main character of this film. And I can’t stand category fraud. But Harvey Weinstein is a genius and made it happen, so if I had a ballot I guess I’d have to go with Waltz. Honestly, I’d probably be transfixed by him reading a set of Ikea instructions. He’s just a perfect match for Tarantino’s dialogue, making every bit of the script count. Emma Stone and Seth MacFarlane noted while announcing the nominees in this category that all five men had won it once before. To them it was a joke, but I wonder how many rode their previous successes to a nomination this year. I left the theater with little impression of Jones, De Niro, or Arkin. All are famous actors and all play characters with memorable lines or story arcs, but never once did I give their performances any special consideration. Arkin, in particular, seems to be taking advantage of his character’s funny quips. And while I agree it’s nice to see De Niro not phoning in a performance, the screaming-OCD-guy act wasn’t wowing me. Then there’s Jones. If he’s not playing a character with such sympathetic morals, does he get so much awards attention? I am quite happy with the Waltz and Hoffman nominations, however. I love how Waltz can be so subtly creepy even while turning on the charm. My vote goes to Philip Seymour Hoffman. While I didn’t particularly care for The Master, his intensity is really something to behold. He’s a little crazy but I can see why his followers would feel attracted to him. The Oscars are less than a week away and we’re taking a look at all the categories we care to. Today it’s Supporting Actor. He probably could have knocked down Sugar Ray. This is a good group, but Christian Bale is an easy winner for me. He shines when he’s onscreen. It’s the line delivery, the manner of speaking, the body language, the way he walks: it’s so fully-formed. Not that it should be surprising; Bale is terrific in pretty much everything. And I think the dude seeks out movies that allow his body weight to swing wildly. Hawkes is my second choice, and perhaps the nomination announcement that made me happiest. He may be the most memorable part of Winter’s Bone. It helps that his character is so important and interesting, but Hawkes is still great alternating between menacing and protective. Ruffalo is also a good choice. It’s not easy being both a douchebag but likeable. And Rush and Renner are unmemorable picks in my mind. Why was Rush the front runner for so long? Snubs: Two of my favorite supporting performances of the year, after Bale, had shots here but came up short: Andrew Garfield in The Social Network and Bill Murray in Get Low. At least I was able to vote for Murray in the Independent Spirits. I’d probably argue that, pound for pound, this category is the strongest of this year’s crop. I don’t have anything bad to say about any of the nominees. And honestly, the five nominees hew pretty darn close to my ideal ballot. If one of the five has to be weakest, then I guess it would be Jeremy Renner. Hampered by a relatively weak script, he plays a very familiar character, the screw-up best friend, but does so very well. Obviously there are significant differences, but I was reminded a lot of Ed Norton’s Worm from Rounders. I think Renner would have had a stronger case had his character been given a little more room to shine. Geoffrey Rush has shown incredible range in his career, further extended by his role his as a speech therapist to a king. Even held to a stricter standard, because (in my opinion) he really is a lead actor in the film, it is hard to find anything to criticize about his performance. Christian Bale is a guy you want in your movie. He always give a consistently superb performance, regardless of the genre of the film in which he’s appearing. But he also seems to allow his co-stars to shine. It is a rare talent indeed who can range from perhaps the ultimate straight man (Batman) to a showy, scenery-chomping character like this one. Especially with this script, Dicky could have been obnoxiously, unbearably over the top. But Bale reels the character in to something much more appealing. So talented, he's also nominated for Animated Short. Only since all these guys can’t be winners, I’m going with Mark Ruffalo as my favorite. Though in all likelihood this order would have been different had I written this entry on a different day. I’m repeating myself, but no actor makes playing a character look as effortless as Mark Ruffalo. If you look over his career, maybe he tends to play a certain general type of character, but it is clearly wrong to suggest he’s just playing himself. I usually hate to fall back on the cliche, but Paul just felt real. As in, not a character, but an interesting person. We’ll shortly get to what I think of the script, but suffice it to say that I’m laying just about all of that on Ruffalo. Says that this category is probably this year’s strongest and can’t decide between Bale and Rush. I assume he also would have insulted at least one of us. This one will be short. 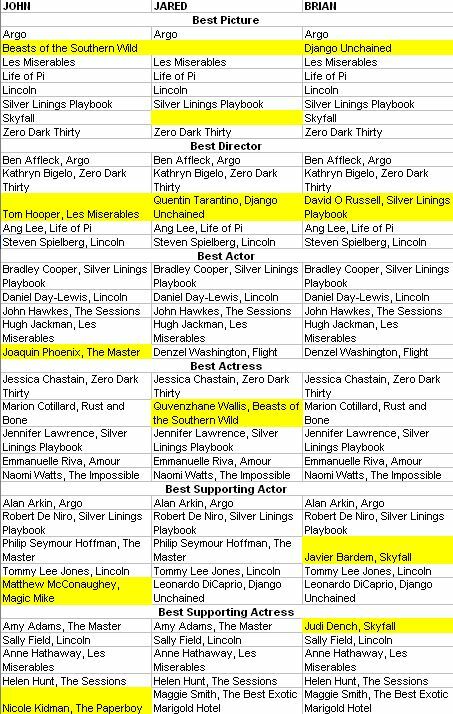 This category is probably the weakest of all the acting categories, and I’m not sure it’s even close. There’s one great performance — and a whole lotta nothing. So first — to dispense with the nothing. Damon as Francois Pienaar, the rugby player who channels Nelson Mandela’s magical wisdom to lead his team to victory (or something like that), is servicable in a pretty standard role. Harrleson as the fast-talking, heartless sergeant also does fine with the role he’s given — but its unevenly written and frankly, I liked him more as a kickass zombie killer in Zombieland. Christopher Plummer in The Last Station — whatever. Great death scene and all — but that whole movie — whatever. Stanley Tucci gets nominated here for playing a creepy dude — and he is wholly unrecognizable in the role, and I’d understand even giving him a nod here had it not been for the highly deserving Christoph Waltz for Inglourious Basterds. Everyone loves a villain, and Waltz is unforgettable. The screen lights up whenever he is on screen, and his climactic Machiavellian maneuver was unexpected. What a fantastic introduction to American audiences — can’t wait to see what he does next.If only Alfred Molina had gotten nominated — then this category could have gotten interesting. Here’s Matt Damon’s every scene in Invictus: FRANCOIS [Standing apart from everyone else, Francois looks mildly confused]: <insert vague, short inspirational speech> Francois leaves room. Matt Damon is pretty great, but a nomination for this? Really? The Morgan Freeman nomination wasn’t enough? Terrible. Going along with Brian, I’m reading this Woody Harrelson nomination as taking into account his three supporting roles this year. Because I’m pretty sure he had the best year supporting actor year if you combine the performances. The Messenger was the weakest, but he mined as much depth as possible from his one-dimensional character. I kinda want to give Christopher Plummer’s beard in The Last Station its own supporting award. Is that possible? Otherwise, sure, Plummer was fine, playing an outsized role to fit in with the movie. What I mean is that I think if, say, Sean Connery had played Tolstoy, I would have enjoyed the film more, but the performance wouldn’t have fit in with the tone. I don’t know what that means, exactly. Plummer isn’t in my top five this year, but I don’t have any issues with the nomination. Stanley Tucci could have made this race more competitive had he been given maybe two more scenes of being creepy or if The Lovely Bones was any good. Can’t say anything negative about him here, and I sure as heck hope he gets multiple chances to come back and claim his prize. 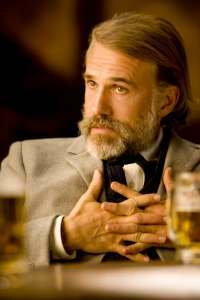 As Christoph Waltz shows, bad guys have more fun. There’s not really a point to me adding to all the wonderful things people have said about his role, so allow me to briefly digress. This race has pretty clearly been over for months; a Waltz loss is nearly inconceivable at this point. It is fascinating to me that of the thousands of supporting acting performances this year, everyone can nearly unanimously agree that Waltz stood head and shoulders above everyone else. What are the odds of that? There seemed to be absolutely no backlash, no one taking up the underdog mantle. Brian asks about Alfred Molina, I kinda wonder if the team behind An Education figured the race was in the bag, they already had other nominations sewn up, why even both giving Molina a push. Christian McKay is the snub here. I cannot believe anyone who put Damon on the ballot watched Me and Orson Welles. Brilliant. I have to admit, I’m a huge fan of villains (big surprise there, I’m sure), and Waltz pulls off a great one. The last three years have given us three very different, but extremely good villains. Bardem’s pushed the limits on intensity and creepiness, Ledger put in the performance of a lifetime with his insanely dark (and darkly insane?) Joker, and now Waltz shows us the lighter side of the Nazi’s intellectual elite (and by “lighter” I mean humorous). As with the last three years, the villain in one of the year’s most acclaimed movies is the “lock” for the win in this category. As with Best Actor, I don’t really have much for this category. Because it’s not really a contest, no one threw out any odd-ball/horrible taste comments. I’m still holding out hope for John to say something stupid, but he won’t be writing his until after I submit mine. But, if anyone can do it, it’s John. It seems like he and Brian have a contest every year to see who can have the worst taste in movies. I’ll let you know who comes out on top this year. The rest of the nominees were, in my mind, pretty weak. Maybe it was because Waltz outshone them on every level, but I’m not convinced. I echo the sentiments of my colleagues when I say that Damon is such a nothing nomination. It’s kind of galling that this performance gets some Oscar love while his splendid turn in The Informant! gets ignored. But it’s really a performance of an accent, the occasional “c’mon guys, we can do it!” speech, and grunting while playing rugby. Plummer is fine but undermined by dreadful material. When we aren’t given any context to a character it’s hard to give him any depth. Unlike my colleagues I found a lot to like in Harrelson’s performance. He’s really terrific in any scene involving the army or notifying next of kin, though a little less so in any scene involving his personal demons. Tucci gave one of my favorite supporting performances of the year… in Julie & Julia. It’s quite a contrast to his serial killer role in The Lovely Bones, eh? I thought he was quite an effective creep and probably the best part of that ill-conceived picture. But of course my choice is Waltz. That’s a bingo! There’s not much more I can say about his delightfully sociopathic performance. I happen to be watching Basterds right now, so let me point out two aspects of this performance that I enjoy. One is his line delivery and the way he can say such awful things with a casual smile. And the second is the way he eats. Like with all his movements, he does it with just the right amount of flamboyance to maximize his sinister air but without really straying into cartoonishness. I’ve never seen a strudel devoured so menacingly. Snubs: The aforementioned Tucci in Julie & Julia. Harrelson in Zombieland of course. Zach Galifinakis in The Hangover. And two random ones for you: Chris Messina and Paul Schneider in Away We Go, the most sincere parts of a painfully contrived film.